This is it! 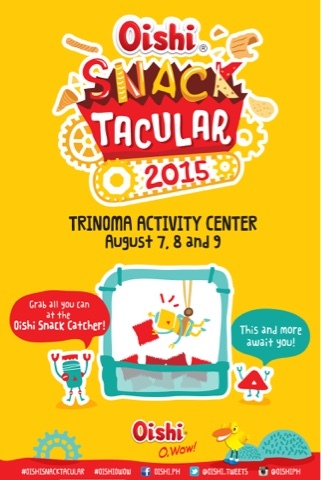 Tomorrow looks so good as Oishi goes out and celebrate a day of fun, good snacks and drinks at the Trinoma Activity Center in Quezon City. It starts on Friday August 7, up until Sunday August 9th. Aside from that, you might see someone you'll like. I heard their endorser might drop by, and you know who that is! You'll love the available Oishi Slush C+, Chogo Chug Ice Cream, Oishi Pillows, Wafu Leche Flans and a lot more extraordinary creations made from your favorite and original Oishi snack items. You know, you're going to miss a lot when you don't go to Trinoma this weekend! I'll be there too so don't take photos while I'm having Oishi Pillows LOL!